Sydney Siege survivor calls for mutual respect. 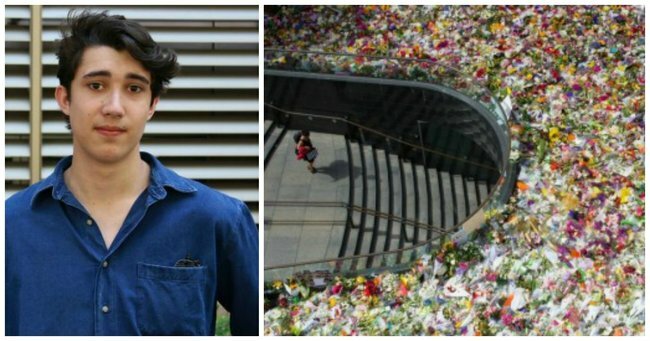 On the week of the anniversary of the Sydney siege, Lindt Cafe employee Jarrod Morton-Hoffman revisits the moment he came face-to-face with a madman. A year ago, I found myself staring down the barrel of a gun. For 17 hours, my fellow hostages and I learnt firsthand how powerless it felt to be at the near total mercy of another — to live or die by the decisions of a madman all too eager to play God. Unlike many others this year, I was lucky enough to escape largely unharmed. A year on, I still struggle to comprehend the senselessness of it all. At first I was angry. In the months following the siege I eagerly waited for the media’s coverage of his life, his history and his beliefs to dwindle to a standstill. I hoped to watch his name die alongside his body. Perhaps because within the brain the connections that control our emotions are so closely knit together, I have found that what we think is anger may be something else entirely. Over time, I’ve realised that what I thought was anger was really just misplaced fear and remorse — fear for my friends and family, and remorse for leaving Tori behind. Once I realised this, I knew I had to let go. Fear is not a smart emotion to act on. Indeed, fear is the very emotion that terrorists seek to spread. Inherently, terrorism can be seen as an extremely violent performance designed to catch the attention of the public and broadcast the terrorist’s goals. For Monis, that goal was to threaten us for our involvement in Syria and Iraq. His objective was to spread fear. His success or failure is based solely on our choice to either remain afraid or be brave. Since last December, there have been many other tragedies across the globe. Men, women and children from different cultures, faiths and nationalities have been indiscriminately killed, wounded and terrorised by evil groups in the name of evil ideologies. These acts are undeniably saddening and frightening. While I will not pretend that I can, or ever will be able to, wholly appreciate the horror some victims of terror have experienced this year, I cannot help but empathise with them on some collective level of mutual understanding and pain. I wish them peace and a swift physical and emotional recovery. However, what has been equally frightening and saddening has been the use of these atrocities by some to promote hatred, violence and fear. While I was angry with a guilty man who happened to be Muslim, some are angry and fearful of innocent men and women because they are Muslim. Goaded by a small band of racist, fear-mongering public figures eager to perpetuate their bigoted dogma by exploiting the global public’s mutual pain and anger in the aftermath of terror attacks like those recently in Parramatta, Paris, Beirut, London and San Bernardino, these individuals attempt to rehash a xenophobic us-versus-them Orientalist dichotomy and exploit the tribal, close-minded fear of the other deeply buried within some. In the end they have succeeded in persuading a minority of people into scapegoating all Muslims for the actions of a few and to engage in rash vigilantism against the greater Muslim community. They have done this through picketing places of worship, assaulting innocent men and women on public transport, intimidating families on the street, planning a celebration for the 10th anniversary of a notorious race riot and discriminating against people based solely on their religious beliefs. These acts do not reflect the Australia I grew up in and that I know exists today — where people from different races, cultures and faiths and whom together forge a collective Australian identity that values inclusivity, compassion, mateship, courage and the egalitarian “fair go”. These are ideals I’m sure most Australians proclaim they stand by. And yet, if we decide to abandon these values we claim define us, in times of crisis, do we really deserve them? I do not mean to vilify or disregard the genuine concerns of others. Thankfully we live in a liberal democracy where people can largely express their views no matter how unpopular they may or may not be. Positive change and social harmony will not occur through belittling the legitimate concerns of some fellow Australians, who believe they’re campaigning for a safer and more secure Australia. It is only natural to want to protect oneself, one’s friends and one’s family. However, ostracising and attacking other innocent people out of fear and ignorance will not stop terrorism — if anything, it only seeks to help the terrorist’s cause. For terrorist groups like Islamic State (IS) to survive, their biggest challenge is to legitimise themselves to Muslims across the globe. Like most gangs and cults, it is well known that IS recruiters prey on the vulnerable, the isolated and the disenfranchised — people who feel abandoned or vilified by their communities. To them, IS propaganda feeds the innate human desire to belong — by promising camaraderie, brotherhood and a “greater purpose”. Thus, it seems like common sense to me that the best way to undermine IS recruiters and their propaganda is to stop making Australian Muslims feel isolated. Perhaps if we stopped trying to force Australian Muslims out of mainstream society in the name of national security, and if we start to once again treat each other with mutual respect and understanding, then maybe Australian Muslims may feel that they have the opportunity and desire to be a part of the broader Australian community. I know that I am not alone in this belief. While some in the aftermath of the Sydney siege succumbed to fear and bigotry, millions of Australians voiced their belief in unity and multiculturalism through the #illridewithyou hashtag. Across the sea in Great Britain, millions more refuse to let extremists rip their communities apart through the #YouAintNoMuslimBruv hashtag. Back home, we now have bipartisan support for messages of tolerance and mutual respect. Changes in rhetoric show that today’s leaders in government are no longer interested in pointing fingers and spreading fear, and are more interested in promoting unity and level headedness. This week marks the first of many anniversaries where we will mourn the loss of Tori and Katrina. We will mourn together as Australians — no matter where we were born or what we believe in — for the needless loss of two of our own. We will also pay tribute to all the other victims of senseless violence across the globe — both those published in the news and the countless others whose stories remain untold each day. Yet, I hope that in years coming we will not have to also mourn the loss of our empathy and foresight. Rather, I hope that we look back proudly that we overcame knee-jerk fear and ignorance, and instead chose to work together and make a difference in a world that needs people to do just that. © 2015 Australian Broadcasting Corporation. All rights reserved. Read the ABC Disclaimer here.